Madison County senior quarterback Travis Jay, an FSU commit, rushed for 160 yards on only seven carries, including touchdown runs of 69 and 67 yards, and junior running back Vinsonta Allen ran for 165 yards on 10 carries and two long runs to paydirt of 55 and 61 yards and the Cowboys pulled away by scoring the last 41 points against the Gators. Madison County struck first just four minutes into the game on the 69-yard run to the end zone by Jay, who is committed to the Seminoles as a cornerback. But Baker answered on the first play of the 2nd quarter, with Junior McLaughlin running in from 15 yards out. Baker had the extra point blocked, but the Gators were within a point at 7-6. But from there, the Cowboys took over. Allen scored his first touchdown just four minutes later and Madison County carried a 14-6 lead into the halftime break. The running game for Madison County continued to run around and through Baker in the second half. On the second play of the third quarter, Allen scampered 61 yards to the end zone to extend the Cowboys lead to 21-6. Then it was time for another big play by Jay. This time it was 67 yards another score and the rout for Madison County was on. From there two Thomas Miller field goals from 30 and 27 yards and two more rushing touchdowns from Patrick Hampton and Robert Hiers got Madison County to a running clock with 6:26 left in the 4th quarter. Baker finishes the season 13-1 after advancing to the state championship game for the second time in three years. Baker lost in the 2016 1A state title game to Pahokee 34-21, but the Blue Devils later had to vacate the championship due to ineligible players. The Gators were led by McLaughlin, who rushed for 61 yards on 24 carries and was 5-for-5 passing for 50 yards. But despite a time of possession advantage of almost 15 minutes over Madison County, Baker only managed 180 total yards. The Cowboys finished the year 13-1 with their only loss coming 48-24 at 7A Lake City Columbia. 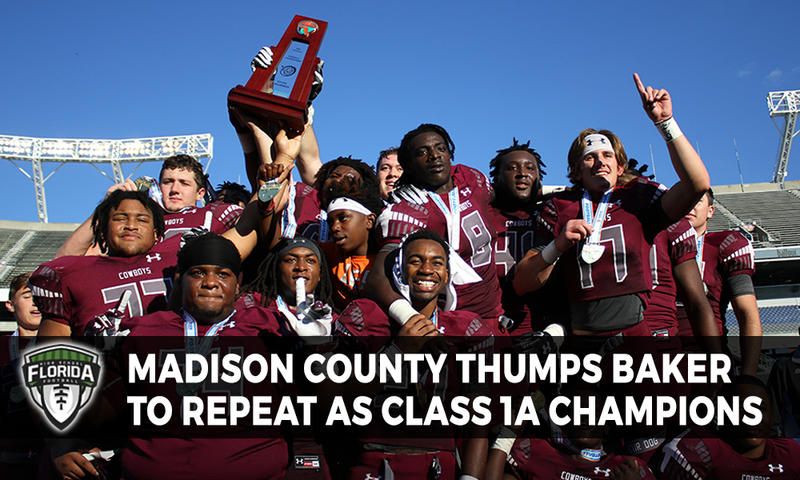 For Madison County, it is their fourth state title in school history and second under Coe. The Cowboys only had the ball for almost 17 minutes and only 37 plays but managed 429 total yards. Coe says it is hard to compare this state title to last year, but he does see some differences.